It’s already 2018, and by now, by far the majority of the good domain names are already taken. If you want to buy a valuable domain either to resell or to develop, you could spend hours and hours combing over the leftover unregistered domains hoping to find something that isn’t absolutely terrible. A better strategy, though, is to think outside the box. Instead of looking for an unregistered domain that no one has thought to buy before, spend your time searching expiring or expired domains instead. 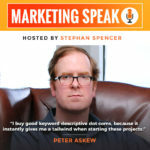 Peter Askew is here to explain just why this strategy is so valuable. Since your domain name is one of your most important digital assets, it’s vital that you get a great one, and he’ll explain exactly how to do that. Peter is an experienced domainer whose successful online businesses include DudeRanch.com and VidaliaOnions.com, both of which he’ll discuss in depth in this conversation.